In general conversation as of late, I’ve been throwing around food terms, assuming others are on my page. The most common question is,“What’s a CSA?” I’m happy to explain (with gusto) that a CSA is the best thing ever. Wondering if there are other food terms I use that people have never heard of, I decided to try an experiment using the husband as my test subject. You’d think he would know all about these particular terms, since they are near and dear to my heart. Even so, I asked him to define a bunch of food-related words, which he did in fine form. Some of the terms he knew, some of them he answered with a question, and some of them he just didn’t know at all (much to my surprise). Here are the results for your reading enjoyment (I’ve put my definition and random comments in italics next to his definition). LOCAL: Food that doesn’t have a commute. Nicely said, Husband. I define local food as food grown in your community or very near your community. I also like to think that local means you know the person growing your food; you and the farmer are part of the same community. LOCAVORE: Someone that eats only what’s in his own house. Very funny. Maybe he thinks this way because I gladly do all the food shopping and it magically appears in the cupboard. A locavore is a person choosing to eat only local foods, preferably raised or grown within a 100-mile radius of his or her own house. Most locavores I know choose organic and sustainable farming methods as well. ORGANIC: Of the earth. That’s a nice way to think of it. More specifically, organic as it pertains to food means no chemicals, additive, pesticides are used in any stage of production. PASTURE FED: Getting a regular dose of God’s Word. Oh, I thought you said PASTOR-fed. That’s more amusing when you realize the husband is actually an ordained minister who preached a sermon in church this morning. Pasture fed just means that the animals (chickens, pigs, cows) have free reign of a pasture in order to eat grass, bugs, etc. This is a sustainable form of agriculture because the cows eat the grass, then fertilize the grass; more grass grows, and cows eat the grass. It’s like the circle of life. GRASS FED: Isn’t that when cows are vegetarians? ALL cows are vegeterians even when fed grain to fatten them up. My definition for pasture fed fits the bill here, too. GMO: Food made bigger and better by chemicals. He’s been paying attention! I’m so proud. Maybe it’s because I compare GMOs to the Teenage Mutant Ninja Turtles, his favorite childhood cartoon. GMO stands for Genetically Modified Organism. This means that the genes of the food have been altered to heighten certain characteristics (like creating food to withstand pesticides). GMOs are banned completely in Europe due to health concerns, but the United States offers countless GMO products. For a list of GMOs, click here. 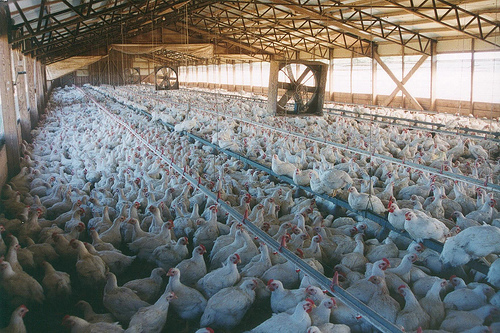 FACTORY FARM: A factory that makes a lot of farms, assembly-line style. Nice try. Factory farming is industrialized farming. Livestock or chickens are raised in dark confinement (in cages or barren plots), too close together, making them suseptible to disease. As a result, the animals are fed a steady diet of antibiotics. This is why grass-fed is better. Better for the animal and better for you. 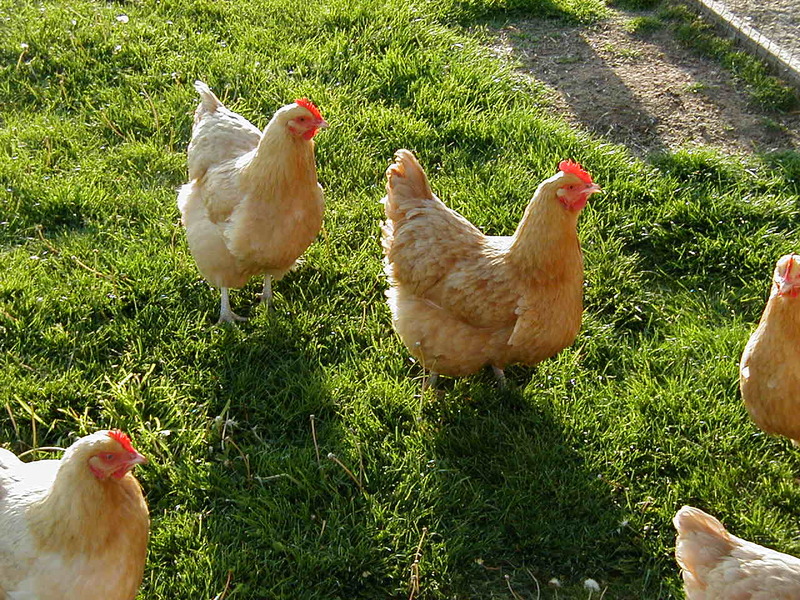 FREE RANGE: When chickens don’t live in coups, and they help out on the farm, kind of like ranch hands. Yeah, chicken ranch hands, free on the range. I’m picturing chickens in tiny vests, riding goats, and lassoing bugs. As nice as that sounds, free range means the animals are able to roam freely and are not confined to cages or overcrowded pens. This method of farming is unregulated and oftentimes, when you see an egg carton or a meat package touting “free range” it means nothing. Perhaps the chicken coup has an open door, but it doesn’t mean the chickens are able to get outside. This is just one reason it’s important to know the farmer raising your meat and another reason to buy local. HORMONE-FREE: Me in the fifth grade. I knew the husband in fifth grade and he’s right. Hormone free means no hormones are added to an animal’s feed to make it grow bigger and fatter in a shorter period of time. Most milk is tainted with hormones as dairy cows are often injected with rBGH. FARM TO TABLE: No middle men. Nice definition. Farm to table refers to a growing food movement in which food is locally grown and sold directly to you by the farmer. A farmer’s market is a nice example, or a farm to table restaurant. The restaurant buys from the grower, not from a corporation like Cysco. COMMUNITY SUPPORTED AGRICULTURE: When a neighborhood has a garden. That’s a very nice sentiment and wouldn’t it be lovely if every neighborhood shared a garden? The official definition as seen on localharvest.org is as follows: a farmer offers a certain number of “shares” to the public. Typically, the share consists of a box of vegetables, but other farm products may be included. Interested consumers purchase a share (aka a “membership” or a “subscription”) and in return receive a box (bag, basket) of seasonal produce each week throughout the farming season. CSA: Pay a sum up front in exchange for produce throughout the growing season. So the husband knows the initials for Community Supported Agriculture. Well done! The definition is the same as above. IN SEASON: Food that’s naturally ripe right now. That’s correct! In season refers to the time of year a food is at its peak of flavor, like asparagus in spring or tomatoes in summer. ALL NATURAL: No chemicals used. Unfortunately, all natural SHOULD mean no chemicals or additives, but I think the term is useless. Anyone can put “all natural” on a food label and it doesn’t mean a thing. Look for Certified Organic or USDA Organic. PROCESSED: I’m assuming that happens in a factory and makes food easier to eat. I believe he meant more convenient to eat, and that’s true. How convenient is a double cheeseburger at McDonald’s? Way too convenient, in my opinion. Processed food can be any raw food that is altered from its original form, but I consider processed food to mean any food that is altered excessively, packaged attractively, and marketed to the consumer. Kind of like a Pop Tart. SLOW FOOD: When the pizza guy takes like 45 minutes. Haha. Actually, slow food is just the opposite of processed food. Making sure food stays in its original form, without processing, chemicals, additives, or engineering of any kind, is what the slow food movement is all about. It’s a new way of thinking about food; a way to counteract our current fast food culture. So what did I learn on this food term experiment? A few things. . . 1.) Maybe the husband’s “listening mannerisms” are the same as his “glazing over mannerisms”. 2.) Food terms can be confusing and overwhelming, even for some one surrounded by them on an almost daily basis (I watch an excessive amount of food documentaries and I like to talk about them to the husband. He is a patient man). 3.) The terms don’t really matter that much, as long as we know where our food comes from and have healthy, local choices available. For example, the husband has not bought a bag of barbecue potato chips since February. That’s progress! Being raised on a farm myself, I just want you to know I’ve been reading and enjoying your blog very much!! Chaulk full of great stuff!! You are a great writer as well!! Hope you are all doing well….look forward to more…oh, also would love to meet that husband of yours 🙂 Sounds like a neat guy! Annette! Thank you for your kind words. 🙂 I’m so glad you are enjoying it. I didn’t realize you were raised on a farm. You probably have a lot to add to my gardening thoughts. Thanks for commenting, so nice to hear from you! We the Ulmer’s are also gardening in your neighborhood. We have always done so. I am loving following your blog… Maybe we can share some produce come summer! I can tomatoes if you need to learn! Thanks for stopping by, Elaine! 🙂 I am definitely going to can some tomatoes this summer. Sounds like we need to have a canning party!